A group of Chinese scientists, headed by Xuejun Jia from the Institute of Physics of the Chinese Academy of Sciences, recently finished the design of the remote handling of the ILC positron target. The target forms part of the positron source and is the place where positrons are produced and then accelerated before they collide with their antiparticles, the electrons. As part of the ILC Technical Design Report (TDR), the remote handling design aims to settle the challenge of maintenance of the ILC positron target. For the target station design in China’s Spallation Neutron Source (CSNS) Project, the target team chose an all-horizontal target arrangement. The horizontal trolley that contains most of the active components in a single assembly can easily be retracted into the target’s remote handling cell. It also reduces the complexity of the shielding and reduces the need for overhead handling. 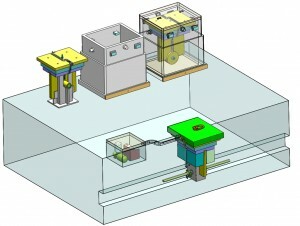 “While referring to those remote maintenance experience and techniques adopted in the CSNS Project, we started a detailed calculation on radioactive sources, protection and shielding for the ILC project and then finished the design for remote handling system of ILC positron target,” introduced Xuejun Jia, professor at the CSNS experimental system. Because of the radiation damage, the ILC target is designed to have a limited lifetime of one year, and must be exchangeable within a reasonable time. Remote operations are always conducted in environments that are either hostile or inaccessible to humans, since it is clear that any problems encountered during operation has the potential to cause very serious and expensive delays. Handling requirements on every component have to be considered on a case-by-case basis. When it comes to remote handling, issues to be considered during the conceptual and detailed design of a component as well as its direct environment includes the expected lifetime of the component and frequency of handling, size and weight of the component, handling areas, etc. In most cases the basic driver is the expected lifetime or end-of-life mode of the addressed component. Jia’s participation in ILC project happened after his meeting with Wei Gai in late 2011, the Global Design Effort (GDE) positron technical area group leader. “I was just looking for an expert team to complete the remote handling design for the ILC positron target. Things happened at the time when I visited the Institute of High Energy Physics (IHEP). I had a chance to meet with the CSNS people and invited Prof. Jia’s team to finish the remote handling design for us. It turned out that they did an excellent job and this is also a very good example of how Chinese scientists make a direct contribution to an international project,” Gai said.